The first Central sugar mill on the island was Central San Vicente established in 1873. The following pages are dedicated to document the sugar mills of which remains are still found, none of which are currently in operation. The following sugar mills at one time operated on the island, but with the exception of Playa Grande in Vieques, have no remains left. Some of the information on the names highlighted in gray was obtained from Volumes 1 & 2 of the 1902 book by José Ferreras Pagan Biografía de las Riquezas de Puerto Rico . Alianza - Camuy (1910-1922). Was organized in 1910 with a capital of $600,000, its principal shareholders were Spanish immigrant from Sóller Andrés Oliver Roses the son of Catalina Roses Bisbal whose family owned Hacienda Santa Barbara , Manuel Ledesma Figueroa (1869-1923), Spanish immigrant from Mallorca Francisco Perelló Cerdá (1874-1925), Sebastian Figueroa Colón (1850-1932), Spanish immigtant from Blanes Agustin Plá Puigmoler (1868- ) and another investor with last name Igartúa. Its machinery was acquired from Central Cambalache who had recently purchased the closed down Central Oriente for its lands. Bello Sitio - Rio Piedras (1873-1891) Was owned by Geronimo Landrau Malaret (1819-1904). In May 1891, with the end of the crop season approaching, the first recorded worker's strike took place at Bello Sitio where laborers demanded higher wages. The strike resulted in the closure of operations. Subsequently, its equipment was sold and installed at Hacienda Monserrate in Rio Grande ca. 1900. Buena Vista - Carolina (1882-1911) Was established at Barrio Hoyo Mulas of Carolina by Ignacio Arzuaga who installed a steam driven mill. In 1882 equipment from the defunct Hacienda Monserrate in Rio Grande was installed elevating it to a central sugar mill. It was later owned by the firm Sobrinos de Ezquiaga, established in San Juan in 1821 by Spaniard Jose Ignacio Ezquiaga (1775-1845) a native of Guipuzcoa in the Basque Country and a relative of Arzuaga. In 1908 it was acquired mainly for its lands by the Loiza Sugar Co. who had recently acquired Central Canovanas . For the 1912 grinding season, its mill was acquired by Cia. Azucarera de la Carolina whose major shareholder was also Sobrinos de Ezquiaga and installed at its Central Progreso. Camuy - Camuy (1912-1913) The publication The Louisiana Planter and Sugar Manufacturer in its edition of July 30, 1910 reports that: "The Camuy Sugar Co. lately established and now erecting its central, expects to be able to put 30,000 sacks of sugar on the market for the 1911-1912 campaign, first grinding being scheduled for Decmber 1911." The edition of November 4, 1911 states that it is a complete new factory referring to its all brand new equipment and machinery. The edition of June 8, 1912 includes an article where they presented their readers with "this new Central sugar factory in PR". It states in the article it is the most modern factory on the island and this the first year of its grinding. Its Board of Directors consisted of Eduardo Georgetti, President; José Machado, Vice President; José Ruiz Soler, Secretary and Pedro G. Amador,Treasurer. However, its shareholders were mainly members of the Amador family. In 1913, it closed down, was dismantled and sold for $150,000 to a group in Venezuela headed by Gen. Ingnacio Andrade former President of that country. The Louisiana Planter ad Sugar Manufacturer in its edition of 12/6/1913 reported that Luis Soler, in representation of Central Camuy's interests, closed on the sale due to financial difficulties. In its edition of 12/1/1917 it reports that the recently erected Central La Ceiba in Maracaibo was the transplant of Central Camuy in Puerto Rico. Central Rio Llano was later erected on the site of Central Camuy. Constancia - Ponce (1910-1954) Constancia evolved from an agricultural partnership established in 1881 by Spanish immigrant Felix Saurí Vivas (1852-1915) and Asisclo Subirá Ramirez de Arellano (1849- ) to operate the Hacienda Estrella. The sugar mill, known at inception as Central Estrella, was owned by Saurí & Subirá & Co. a corporation formed by the heirs of Felix and Asisclo, one of whom was Felix son Rafael Sauri Tristani (1881- ). It owned most of the land used for growing sugarcane making it practically independent of cane purchased from colonos. The 11/30/1917 edition of trade publication The Louisiana Planter and Sugar Manufacturer states: "The advent of the first mill making white sugar direct in Porto Rico marks a new era in the industry in the island. It was put in at Central Constancia at Ponce. Sauri & Subira, the owners, have been making sugar for direct local consumption for years and have been putting out a sugar somewhat whiter and purer than the ordinary raws, but now this white sugar made so by sulfur, lime and filtration processes marks a great era of advancement. The installation cost $250,000 and the sugar cane capacity of the plant will be 250 tons daily." The machinery was manufactured by Krajewski Pesant Corp., Inc. who had built the manufacturing plants at Central Vannina and Central Lafayette . Corsica - Rincón (1885-1920) It was established in 1885 as an Ingenio known as Hacienda Corsica by Domingo Rafucci Padovani, a Corsican immigrant who in 1888 returned to France leaving his son Alfredo Rafucci Bayrón as administrator. Alfredo soon developed the Ingenio into a Central sugar factory, by 1912 it had approximately 1,164 company controlled acres planted with sugarcane which included those of the old Hacienda Tres Hermanos in Añasco. In 1913 Corsica secured a $100,000 loan from the West India Sugar Financing Corporation, that year Ramón Aboy Benitez, also owner of Arcadia in Vieques, was its President, Jaime Sifre also of Carmen Centrale was its Administrator and George Dana Graves, in representation of the West India Sugar Financing Corporation was its Treasurer. Corsica was located on the right hand side of the railroad tracks from Aguadilla to Mayagüez at Km 22 about 100 m from the sea shore in a valley by "cerro" San Francisco about 4 km south of Rincón. Two sons-in-law of Domingo worked at Corsica, César Emilio Dechoudens whose uncle owned the nearby Hacienda Eugenia was the sugarman and Corsican immigrant Esteban Steffani the father of Luis Steffani Rafucci was the accountant. Defensa - Caguas (1920-1939) Central Defensa, Inc. was incorporated April 30, 1920 by Caguas Mayor at the time Juan Gimenez Garcia, Marcos Gimenez and Jose B. Mendez. In her book Santa Juana Y Mano Manca , Ivonne Acosta Lespier states that its main shareholders were Pablo Hereter, Joaquin Vendrell, Fernando Guarch Rios, Cipriano Manrique, Manuel Quiñones Cabezudo, Domingo Lasa Quiñones, Nicolás Solá and Harrison Johnson. The mill was constructed with the old Central Corsica machinery next to the old Hacienda Santa Catalina with 1923 being its first grinding season when it produced 4,407 tons of sugar. Guarch Rios ownership interest in Defensa was to supply the new factory with sugarcane grown in his still large sugar plantation Hacienda San José rather than selling it to foreign owned Central Santa Juana . El Ejemplo - Humacao (1898-1962) Was located in Barrio Mariana about 6 miles from the Port of Humacao. El Ejemplo's beginning date to 1896 when Roig acquired 12 cuerdas and a steam mill segregated from the 1,878 cuerda Hacienda Providencia owned by Rodulfo Leoncio Perez. Roig then installed machinery acquired from the Pioneer Iron Works in NY elevating it to a Central sugar mill in 1898. Financing for the purchase was provided by Fritze, Lundt & Co. for whom Roig had worked in Mayagüez where his father was established after immigrating from Catalonia, Spain. In its beginning, it started without land of its own processing sugar cane grown by colonos, its main colono being Perez himself who agreed to grow 400 acres of sugarcane to be processed at El Ejemplo. Perez also agreed to allow railroad tracks to be laid on his land for the use of the sugar mill. The Cia. Azucarera El Ejemplo was incorporated July 17, 1909 by which time Roig owned approximately 12,500 acres and leased some 5,000 additional acres to grow sugarcane for his mill. By 1935 almost all sugar cane it processed was grown on lands of the Roig family. Its machinery was sold in 1965 to the South Florida Sugar Co.
El Ingenio - Yabucoa (1891-1903) Was established in Barrio Aguacate by José Anglada in 1891 who in 1898 sold it to Manuel Argüeso Flores and his wife Ernestina Frias Noya. It had 1,200 acres of its own of which 600 were planted with sugarcane and processed sugarcane from several colonos in the area. In 1903 Mullenhoff & Korber instituted foreclosure proceeding for unpaid debt and crop financing contracts which legal case bacame very bitter and complicated involving El Ingenio, its lands and other creditors as well. On December 9, 1904 title to El Ingenio and its lands was deeded to Mullenhoff & Korber and according to a "secret" agreement between Mullenhoff & Korber and Argüeso intended to erase a second mortgage held by the firm Bertran & Casañas, on July 6, 1905 title to the lands except for a tract of land retained by Mullenhoff & Korber in satisfaction of their lien, was reverted back to a Agüeso's brother in law Atty. Salvador Fulladosa Mir at the request of Argüeso. Fortuna - Rio Grande (1892-1909) Its original owners when just a blood driven mill were Avelino (1828-1885) and Félix Rexach Porrata Doria who sold it to Eugenio Benitez Guzmán ca. 1867. Benitez Guzmán sold it to Medesta Román who in turn sold it to Alfredo Cristy Vanell (1835-1932) in 1892. Under Benitez Guzmán ownership, a steam driven mill was installed but shortly thereafter the sugar factory was closed and its equipment sold to and installed at Hacienda Carmelita. When Cristy acquired the property he installed a mill, boilers, vacuum pans, centrifugals and other equipment from Hacienda Santísima Trinidad of his property in Mayaguez which had shut down due to an epidemic that affected sugarcane in the area. As of 1902 Manuel Gonzalez operated the factory on lease since 1899. Juanita - Bayamón (1895-1963) Its origin dates back to 1890 when Spanish immigrant from Palma de Mallorca Antonio Monroig Oliver established a factory to produce molasses and muscovado sugar. In 1895 the factory building was expanded and new vacuum pans, centrifugals and boilers were installed elevating it to a Central sugar mill. It had a modern 750 KW Westinghouse turbine to drive all the machinery except the mill which was steam driven. After Antonio's death on April 20, 1903, it was owned by the firm Antonio Monroig e Hijos consisting of his wife Josefa Obrador Vilá and their children Juan, Antonio, Valentin and Maria Monroig Obrador. In 1911 it was acquired by Central Juanita, Inc. whose main shareholder was the Fonalleda family. In 1937 the main shareholders of Central Juanita, Inc. were Jaime and Guillermo Fonalledas, Rafael Arrieta and Dr. José A. Lopez Antongiorgi. It was located West of the road to Cataño and East of the Bayamon River 1 Km more or less from the train station. The Bayamón River crossed its 800 acres from South to North which river was used to transport sugarcane from the fields to a dock near the factory. Juliana aka Herminia - Villalba (1919-1948) The Louisian Planter and Sugar Manufacturer Volume 44 No. 23 of June 4, 1910 states; "Latest advices proclaim that the incorporation of the new Central of Villalba has been effected, the organizers and the principal shareholders being such well known sugar men as the Sres. Verjas (sic), Serrallés, Astol, Oppenheimer, Claussells, Marvin and Fabián." It is widely accepted though, that Walter McK Jones (1883-1944) a native of Boston, founder and first Mayor of Villalba, established Central Juliana in 1919. In 1940 it is acquired by the Semidey family of Coamo who changed the name to Herminia. Its last known owner was Herminia Colón vda. Semidey. Las Claras - Arecibo (1877-1906) Fernando Fernandez Umpierre (1839-1898) Marqués de las Claras was a rich sugar baron in Arecibo who built his house known then as Palacio del Marqués de las Claras. This property later came to be the Casino de Arecibo. His daughter Manuela Fernandez Muñoz (1864-1902) was Marquesa de las Claras, she married Manuel Elzaburu Vizcarrondo and in 1898 married in Madrid for a second time her brother in law Francisco Elzaburru Vizcarrondo. The Marquesa de las Claras acquired this property from Francisco Serrat ca. 1877 when it became a Central Sugar Mill. In 1902 its Manager was Bernardo Huicy. It was located near the Rio Grande de Arecibo on the old road to San Juan South of the railroad tracks and near the Cambalache train station. In 1906 Central Las Claras was acquired by Central Cambalache . Laura - Yabucoa (1884-1901) Was owned by the firm Cintrón Hnos. comprised of Jose Facundo; Zoilo; Carmen Margarita who was married to Mariano Martorell and Eulalia who was married to Aurelio Dapena Moreno the Administrator of the firm. Laura consisted of 491 cuerdas property of Cintrón Hnos., another adjacent 440 cuerdas known as "Cercado Diamante" and "Dos Rios" plus another 231 cuerdas known as "Palmarejo" and "Margarita". It also had a 3 Km railroad line. In 1895 Cintrón Hnos. recived a 90,000 Mexican Pesos loan from the Banco Territorial y Agricola. On May 23, 1900 due to unpaid installments on this loan and subsequent advances, Cintrón Hermanos represented by its Administrator Aurelio Dapena Moreno, handed over the administration of Laura to the bank who had its sugarcane processed at Central Roig . On September 30, 1902 Banco Territorial y Agricola began foreclosure proceeding on the mortgage received to secure the above loans, acquiring title to Laura on March 26, 1903. Luisa - Manatí (1872-1922) Hacienda Luisa was an oxen driven trapiche owned by Spanish immigrant from Blanes, Catalonia Francisco Brunet Urgell until 1872 when a steam mill was installed. Shortly after the installation of the steam mill, additional machinery was installed elevating it to a Central sugar mill. Luisa consisted of 1,400 cuerdas extending throughout the Barrios Bajura, Punta, Boca, Tierras Nuevas, Bajura Afuera and Tierras Nuevas Poniente of Manatí and according to José Ferreras Pagán in his 1902 book Biografia de las Riquezas de Puerto Rico , its land included those of the defunct Hacienda Media Luna on lease. It was adjacent to Hacienda La Espereanza on the North and West and to lands of Central Monserrate . In 1922 Federico Calaf Rivera signed a 6 year lease agreement of Luisa with Sucn. Francisco Brunet. The Sucn. Francisco Brunet was composed of: Francisco Brunet Guayta (1877-1917) represented by his widow Rita Calaf Collazo (1884-1976) the daughter of Federico Calaf Rivera (1845-1924) owner of Central Monserrate ; Rosenda Brunet Guayta (1887-1945) who married Adolfo de Hostos y de Ayala (1887-1982) son of Eugenio Maria de Hostos ; Micaela Brunet Guayta (1873-1933) who married Fernando Geigel Sabat; Josefa Brunet-Guayta (1873-1955); Rosa Brunet Guayta (1874-1957) who married Salvador Sierra Amalbert and Luisa Brunet Guayta (1871-1949) who married Abelardo de la Aba who was the sugar mill's manager. This lease was sublet to Julián Gandia Córdova who was the administrator of Central Monserrate who then processed its sugarcane. Luisa - Maunabo (1874-1883) Central Luisa was elevated to a Sugar mill in 1874 when owned by Louis Francois de Boyrie and his wife Luisa Pillot who acquired it when an ingenio from Alberto I. Bentegeat y Brisart. Reportedly, by 1883 the ingenio had ceased operations when Cail & Co. foreclosed on machinery they had supplied and financed for approximately $64,000 which machinery was sold to Eugenio María Vergés, co-owner of Central Columbia . A foreclosure suit was decided in 1886 in favor on Bentegeat for an unpaid mortgage in the amount of $6,600. On November 4, 1886 the Court ordered the sale in Public Auction of assets valued at $9,988 including Hacienda Oriente, also known as Luisa, in the Barrio Talante of Maunabo consisting of 190 cuerdas and several structures in poor condition including a deteriorated sugar processing plant and two chimneys. In 1883, after his failed venture, De Boyrie left for the Dominican Republic where he was involved management of Ingenio La Francia that was established that same year. Pagán - Añasco (1883-1918). It was located about 5 minutes Southeast of Añasco near the train station, its land comprised the old haciendas Ursula, Librada, Cipriana and Elisa; the Rio Daguey meandered through its lands. The 1984 document titled Añasco: Notas para su Historia written by Dr. Carlos Gaztambide Arrillaga states that Juan Bianchi was the original owner of Pagán while a hacienda. Bianchi was born in Añasco and was married to Luisa Bracetti the sister of Mariana Bracetti - Brazo de Oro . After the death of Juan Bianchi in 1827, Luisa married Juan Pagán and after his death in 1873, the hacienda was inherited by her son Juan Bianchi Bracetti (1829-1902) also known as Juan Bianchi Pagán in honor of his stepfather Juan Pagán who raised him since age 2. It was later owned by Juan Bianchi Rosafá the son of Juan Bianchi Pagán and Rosario Rasafá and subsequently leased in 1910 to La Guanica Centrale . Pasto Viejo - Humacao (1907-1958). It was located on the banks of the Anton Ruiz River. Although its first milling season appears to be 1907, it was first organized under the name Humacao Sugar Co. by Cuban born William L. Bass also owner of Ingenio Consuelo in San Pedro de Macoris in the Dominican Republic. On May 16, 1907 the Puerto Rico Sugar Co. was incorporated to acquire Pasto Viejo from the Humacao Sugar Co., being its first Board of Directors comprised of Eduardo Georgetti, President; Luis Rubert, Vicepresident; Abelardo de la Haba, Secretary; José Ruiz Sóler, Assistant Secretary; Gerónimo Vallecillo, Treasurer; Rafael Balseiro, Assistant Treasurer; Jose Toro Rios and Carlos Armstrong Directors. Other notable shareholders were Juan Carlos McCormick, Rafael Fabian, Luis Toro Pasarell and Ramon Aboy Benitez, US investors H. C. Guiler, George T. Parker and Moses A. Walker and German capitalist Waldemar Hepp. In early 1910 because of financial difficulties, the assets of the Puerto Rico Sugar Co. were acquired for a reported $925,000 by Borinquen Sugar Co. whose majority shareholders were Rafael Fabian and Juan Carlos McCormick. Borinquen Sugar Co. struggled every year of its existence and in 1912 Hernand Behn was appointed by the Court as receiver. In 1914 while under receivership, a group known as the Federal Syndicate of Humacao rented and operated the sugar mill for the 1915 grinding season which was Pasto Viejo's first successful season. In June 1915 members of the syndicate organized Central Pasto Viejo, Inc. and purchased at public auction the assets of Borinquen Sugar Co. Reportedly the person behind the syndicate's success was Engineer Ignacio Peña who had 7 years experience in the US and had worked at Central Constancia in Toa Baja which was run by his uncle Francisco Arrieta. Pasto Viejo was one of the 5 Centrales that in 1926 were acquired to form the United Puerto Rican Sugar Co., later known as Eastern Sugar Associates after United filed for bankruptcy in 1933 and was lastly owned by the Fajardo Sugar Co.
Progreso aka Victoria - Carolina (1887-1958) Progreso was located in what was the 620 acre Hacienda Aurora owned by José Saldaña, later by Manuel Saldaña and the subject of a painting by Francisco Oller included in the gallery below. It was built in 1887 on 15 acres sold by Manuel Saldaña to Lamb & Co. a British firm with offices in St Thomas. Crosas & Finlay managed it until 1888 when The Puerto Rico Sugar Factory Ltd. whose main shareholders were Lorenzo D. Armstrong of the NY commercial banking firm L. W. & P. Armstrong and British citizen Frederick Barnes took control of Progreso. By 1900 it was owned by Mayrn, Armstrong and Finlay Bros. & Waymouth and its administrator was Enrique Van Rhyn. 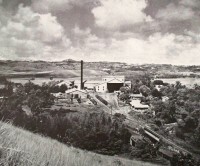 In 1910 the Compañia Azucarera de la Carolina owned by Sobrinos de Ezquiaga bought the Central from Finlay Bros., the new owners added lighting and built new offices with electricity and in 1912 installed the mill, centrifugals, crystallizers and a large Stirling boiler from the recently closed Central Buena Vista. In September 1919 E. Rubert, Eduardo Georgetti, Enrique J. Gonzalez, J. D. Riera, A. de la Haba and B. Rubert formed a five year agricultural and industrial partnership under the name Central Victoria, Ltd. A transfer was made to the partnership of the sugar factory Central Progreso and of other properties of the Compañia Azucarera de la Carolina. The partnership commenced operations under the presidency of Gonzalez. Rafael Fabian acquired interest in Victoria by purchasing part of the interest of J. D. Riera from his estate. In 1921 the court appointed a receiver due to dissent between the partners, which order was set aside by petition of E. J. Gonzalez. The chimney, which was the last remaining structure of this sugar mill was imploded in 2011. Providencia - Patillas (1902-1917) It was originally an ingenio known as Rio Chico owned by Modesto Bird León. It was acquired in 1902 by Puerto Rico born Antonio S. Alcaide Baiz (1863- ) who was married to Estella Riefkhol Mourier (1863-1942) the daughter of German immigrant Otto Riefkhol, Luis Francisco Vergés (1869-1910), Guillermo McCormick Hartman (1861-1907) and Guillermo Riefkhol Mourier who was its administrator. When acquired in 1902, new equipment imported from the US was installed which elevated it to a Central sugar mill. Vergés and Riefkhol also had ownership interests in Central Columbia and Vergés and Alcaide in Central Machete . Its sugarcane came from 1,400 acres of its own in Patillas and from leased land of the old Hacienda Enriqueta in Arroyo. The American Sugar Industry and Beet Sugar Gazette in its November 1909 edition stated that Providencia "was put up for sale in a court action for collection of moneys and 1,200 acres of cane lands are thus on the market". Its machinery was removed and installed on time for its first grinding season in 1923 at Central Monte Llano in Puerto Plata, Dominican Republic. In 1928 its remains were destroyed by hurricane San Felipe and in 1929 was acquired by Sucn. Fantauzzi Hnos. owners of Central Lafayette mainly for its railroad system in order to transport to Arroyo sugarcane previously processed at their recently closed Central Columbia . Reparada - Ponce (1883-1900). This sugar mill was located in the general area where the Pontificia Universidad Catolica is today. At one time there was a "Barrio" in Ponce called Reparada which more or less comprised the area south of the railroad tracks (today Calle Ferrocarril), west of the Rio Portugués old course, north of the Bypass (PR-2) and east of PR-2R (where Paquito Montaner Stadium is). It had water rights to draw water from the Portugués River and the Canas River which ran between Hacienda La Matilde and Reparada. It was originally owned by Ramón Cortada Quintana (1833-1905) and was acquired in 1883 by José Gallart Forgas (1838-1898) and upon his death owned by the Sucn. Gallart, and reportedly at one time also by Mario Mercado Montalvo, owner of Central Rufina . It appears the name Reparada was given by Gallart in honor of his mother Reparada Forgas Bayo. It had 1,100 acres of its own land of which 800 were used to grow sugarcane. Restaurada - Ponce (1888-1903) It was one of the first haciendas in the area dating back to the 1700s. It was located in barrio Vayas and was originally owned by the Ortiz Matos family of Ponce who sold it to Catalonian immigrant José Pica ( -1831) in 1825. Upon Pica's death, his relative and also Catalonian immigrant Luis Font managed the hacienda, which despite having only 65 "cuerdas" in 1845 increased its sugar production and became a very efficient and succesful operation. Font was a Catalonian immigrant who arrived in Ponce around 1830 and married Josefa Pica the daughter of José Pica. By 1866 the hacienda was owned by Luis Font who ca. 1875 sold it to Miguel Arribas Escribano (1834-1897) and upon his death was owned by his daughter Hortensia Arribas de Canals (1869- ). Rochelaise - Mayaguez (1908-1957). Its origin dates back to 1846 when French immigrant Juan Forestier acquired 275 cuerdas and named the Hacienda Rochelaise in memory of his birthplace in France, La Rochelle. Begining in 1873 a series of loans were taken from Latimer & Cia. which resulted in the foreclosure in 1878 by its major creditor the NY Merchant firm of D. De Castro & Cia., Borda & Cia. and Dr. Carlos Grivot and his wife Carolina Kobly. In 1883 D. De Castro & Cia. sold its ownership interest to Luisa Kluglist, the wife of Wenceslao Borda Rueda in exchange for shares in the Canovanas Sugar Co. Ltd. in a transaction where De Castro & Cia. was to satisfy all debt owing to Grivot & Kobly and other creditors involved in the liquidation of Latimer & Cia. During the economic crisis at the end of the 19th Century, Hacienda Rochelaise was reduced to pasture land. Central Rochelaise was established where the old hacienda was by David D. Wilson who was also related to Central Igualdad and Central Oriente and Mayagüez born and Paris educated Oscar F. Bravo González (1882-1964) and his wife Rudecinda Monagas Bianchi the daughter of Estela Bianchi Rosafá whose family also had ownership interests in Central Pagán in Añaco and Central Coloso in Aguadilla. Bravo first worked in NY and upon his return to Puerto Rico was employed by Schultze & Co., a German commercial merchant house established in Mayagüez. In 1908 ownership was transferred to the Mayagüez Sugar Co. whose main shareholders were Bravo, David & Robert Wilson, Chase Ulman and his brother-in-law and Ponce born José Miguel Morales Alvarado who was married to Sara Bravo Gonzalez. After Oscar F. Bravo Gonzalez retired in 1940, his son Eng. Jose Oscar Bravo Monagas was at the helm. After its closure in 1957, its sugarcane was processed at Central Igualdad and its machinery was sold as scrap metal in Mexico. San Cristobal - Naguabo (1905-1913) Hacienda San Cristobal was established ca. 1855 by Spanish Immigrant from Catalonia Tito Patxot with an oxen driven mill. Spanish immigrant Alejandro Viader Soler (1834-1901) acquired the property ca. 1875 and updated it with a steam mill in 1899 and operated it until his death. Since his wife Maria Hernandez and two daughters Josefa (1876-1994) and Alejandrina Viader Hernandez (1873-1997) had preceded Alejandro, upon his death Hacienda San Cristobal was inherited by his son Igancio (1880-1909) and daughter Dolores Viader Hernandez (1875-1960). The Louisiana Planter and Sugar Manufacturer Volume 21 No. 25 of December 17,1898 reports that: "A Philadelphia syndicate has acquired a large tract of land in the District of Naguabo, on the east coast, and are about to commence planting and the erection of buildings, etc." San Cristobal was the first US investment planned after the 1898 occupation, however, its establishment took some time allowing Central Aguirre to be the first US investor owned Central Sugar Mill established in Puerto Rico after the US occupation. According to José Ferreras Pagán in his 1902 book Biografía de las Riquezas de Puerto Rico, San Cristobal was still a hacienda owned by Ignacio and Dolores Viader Hernandez, it was under the ownership of Igancio and Dolores that San Cristobal was upgraded to a Central sugar mill in 1905. In 1910 after Igancio's death, it was acquired for a reported $900,000 by The Central San Cristobal Corporation, incorporated in Connecticut in 1910 to acquire San Cristobal and the Hacienda Esperanza in Naguabo adding its mill and equipment to San Cristobal's plant. The Central San Cristobal Corporation went into receivership in mid-1913, a syndicate headed by Sosthenes Behn leased San Cristobal for the 1914-1915 grinding season which was not successful. In 1915 the Federal Court ordered its sale for the benefit of its creditors and in 1916 it was dismantled and its machinery acquired by Central Fajardo who in turn sold its machinery and eqipment in 1917 to Macorís Sugar Co. in the Dominican Republic and became Central Las Pajas. Central San Cristobal was the only fully US owned sugar mill that turned out to be a failure. San Francisco - Naguabo (1876-1879) Was owned by the firm Busó & Viader comprised of Juan Busó Quintana and Alejandro Viader. San Luis - Carolina (1874-1876) Was owned by Teodoro Chevremont Couvertié (1839-1896). San Miguel - Luquillo (1926-1931) Was owned by Diego Zalduondo Veve (1878-1940). Its first grinding season was 1927 when it produced 4,340 tons of sugar. Was damaged by San Ciprian Hurricane and was never rebuilt, last grinding season was 1931 when it produced 3,279 tons of sugar. It filed for Bankruptcy in 1931. Utuado - In 1910 Utuado Sugar Co. contracted NY based Lebedjeff & Co. to build a Central sugar factory in the municipality of Utuado with the condition that it be operational by January, 1915 for the 1914-195 season. The main shareholders of Utuado Sugar Co. were Eduardo Georgetti, Carlos Cabrera, Carlos Soler, Adrian Cueto and Carlos Morales Alvarado among others. By 1916 it was already under receivership. 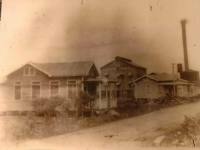 Vannina aka San José - Rio Piedras (1910-1952) It was located on the lands of the old Hacienda San José established ca. 1830 by Alonso Andrade who operated an oxen driven mill. It was later owned by Spanish immigrant Jose Solís and then his son Joaquín Solis Kercadó (1825-1897) who installed equipment from the defunct Hacienda Media Luna and Hacienda Monserrate in Dorado. Upon the death of Joaquín it passed on to Sucn. Solís composed of Joaquín's wife Aurelia Amy and their sons Francisco, Joaquín, Natalia, Josefina and Maria all Solís Amy. In 1902 its administrator was Miguel Emannuelli Costa who was married to Natalia. The Louisiana Planter and Sugar Manufacturer Volume 44 No. 24 of June 10, 1910 states that: "Many new centrals are being planed for erection during the present year, three being certainties - viz., Arecibo, Camuy and Rio Piedras. This last expects to be in operation for next season. The capital is said to have been raised in Germany with a Porto Rican management." Vannina Corporation was incorporated in 1911 with a subscribed capital of $300,000 and began operations in February 1911. Its initial Board of Directors was comprised of Santiago Lorenzi, Antonio Caubet Pons, Vicente Antonetti Antonini, Joaquin Villamil, A. Gautier, G. Candina, G. Sagastibelza, Bernado Gil, A. Somoza and P. Castaños. As a result of a request in 1914 by Sucrs. de Abarca, the District Court of San Juan appointed Abelardo de la Haba and Rud Myohl as receivers to run the affairs of Central Vannina. Successful operations rescued Vannina Corporation from receivership in November 1916 until it ceased operations in 1939 when it was acquired and the name changed to Central San José. Arcadia (1908-1917) Was owned by Luis Manuel Cintrón Sanchez (1848-1917) also owner of Hacienda Fortuna in Fajardo. Upon its closure after the 1916-1917 grinding season, Arcadia's fields were sold by its then owner Encarnación Aboy Benitez (1864-1949) the widow of Luis Manuel to the Benitez Sugar Co., owners of Central Playa Grande. Encarnación was the daughter of Ramón Aboy Hernández and Petra Benitez Guzmán the sister of José Benitez Guzman the principal shareholder of Benitez Sugar Co.
Vieques aka Esperanza aka Puerto Real (1910-1927) Established by Victor Mourraille Roussel, a Frenchman from the Guadeloupe island of Marie Galante from the merger of his hacienda in Puerto Ferro with a hacienda in Barrio Mosquito owned by Frenchman from Saint Domingue Victor Martineau Voyard (1823-1893). Enrique Bird Arias (Brother of Jorge Bird Arias of Fajardo Sugar Co. ) acquired Esperanza from Victor's son Gustave Mouraille Longpré after a big labor strike in 1915. After Enrique's death on March 4, 1919 all the assets and rights of the Esperanza Central Sugar Company were sold at public auction by the marshall of the US District Court for PR to the Colonial Sugar Company as a result of a suit filed by L. W. & P. Armstrong for an unpaid mortgage of $1,730,000. On November 17,1929 the Colonial Sugar Company transferred and conveyed all its assets and rights to the Fajardo Sugar Company. The Fajardo Sugar Co. then sold it to United Porto Rican Sugar Co., later Eastern Sugar Associates (also owners of Pasto Viejo, Santa Juana , Cayey , Juncos and Defensa). Under the ownership of United Porto Rican Sugar Co./Eastern Sugar Associates, sugar cane grown on the plantation after 1927 was processed at Central Pasto Viejo in Humacao. The structure of the main house of the Puerto Real Central Sugar Mill, later known as "La Casa del Francés" alluding to the nationality of the original owner Victor Mourraille, became a well known small hotel and inn. Today, the structure is in ruins because of a fire that occurred in 2005. Puerto Real's land was subject to the government's enforcement of the 500 "cuerdas law as can be seen from this court document . Playa Grande (1899-1942). This was the only sugar mill in Vieques in operation by 1930. Its origin dates to when three Danish immigrants consolidated three haciendas: Marquisat de St. Jacques, Pistolet and Resolución under the name Resolución. José Benitez Guzmán (1840-1900) acquired Hacienda Resolución and in 1892 bought Playa Grande from another Dane called Matias Hjardenal, consolidating it with Resolución. Benitez Guzmán improved its machinery and installed a steam mill and by 1899 had converted it into a Central Sugar mill. After José's death, it passed on to his children through the Benitez Sugar Co. represented by Jose Juan Benitez Diaz (1865-1947) who was married to Maria de Anca Benvenutti daughter of Carolina de Anca who married Carlos Cabrera Paz owner of Central Florida . In 1936 it was in receivership due to unpaid debt to the Bank of Nova Scotia and was sold to Aurelio Tió who operated it until 1942 when its lands were expropriated by the US Navy. The mill itself was not expropriated but without sugar cane to process, it shut down. Miguel Angel Garcia Mendez, owner of Central Igualdad, bought the equipment and in 1946 sold it in Belle Glade, FL to Okeelanta Sugar Reginery, Inc. When Okeelanta istalled more modern equipmet, it was sold to Manatí Sugar Co. in Cuba. This YouTube Video by the Vieques Conservation and Historical Trust is very intresting tour of the sugar mill ruins. Santa Maria (1896-1922) Its predecessor was established by Ildefonso Leguilton with an oxen driven mill. It was acquired in 1896 by St. Thomas native Carlos Petit LeBrun Bartolomey (1859-1928). Reportedly it had a distillery and produced Ron Santa Maria. It had about 2,000 acres of its own of which approximately 600 acres were used to grow sugarcane. Following is a gallery of pictures of sugar mills of which there are no remains left today obtained from the University of Puerto Rico at Mayaguez Library and El Mundo Newspaper.